The MDI System consists of a miniature titanium implant that acts like	the root of your tooth and a retaining fixture that is incorporated into	the base of your denture, The head of the implant is shaped like a ball	and the retaining fixture acts like a socket that contains a rubber O-ring. The O-ring snaps over the ball when the denture is seated and holds the	denture at a predetermined leve of force. When seated, the denture gently	rests on the gum tissue. The implant fixtures allow for micro-mobility	while withstanding natural lifting forces. Late in 1997, Dr. Sendax collaborated about his mini implant theory and	design concepts with a colleague, Dr. Ronald A. Bulard. Dr. Bulard had	previously formed a dental implant company, IMTEC Corporation, which was	at the time manufacturing and marketing standard sized dental implants,	abutments, and other dental products. Convinced they were on to something	special, the two implantologists spent countless hours studying and refining	Dr. Sendax’s original creative design, resulting in a more efficient	top and collar to the mini dental implants. 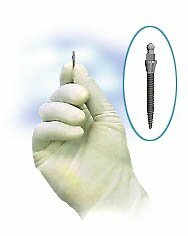 Combining this now re-designed	mini implant with Dr. Sendax’s original insertion protocol resulted	in a successful breakthrough. Under Dr. Bulard’s direction, IMTEC	Corporation began the rather complex and expensive design and manufacturing	procedures which ultimately resulted in what is now offered to the dental	community under the brand name IMTEC Sendax M D I (mini dental implant). The innovative system and procedure was thereafter formally introduced	to the United States dental community at an implant conference in Orlando,	Florida in April, 1999. It was an instant success and now represents one	of the fastest growing segments of the dental product industry.